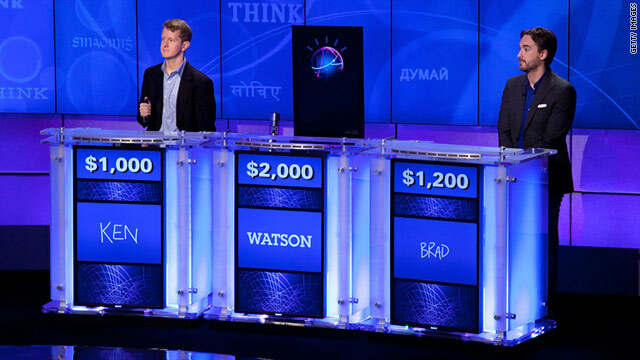 IBM’s Watson computer is competing against former champs Ken Jennings, left, and Brad Rutter on “Jeopardy!” this week. (CNN) — The computers haven’t proven to be our trivia overlords just yet. Give them at least until Wednesday. An IBM supercomputer named Watson finished one round of the TV show “Jeopardy!” on Monday night tied with one of his human competitors and $3,000 ahead of the other. The man vs. computer face-off won’t be complete, however, until the final rounds of the extended trivia game show are aired on Tuesday and Wednesday. IBM trumpets Watson, which has been in development for years and has the processing power of 2,800 “powerful computers,” as a major advancement in machines’ efforts to understand human language. The computer receives clues through digital texts and then buzzes in against the two other “Jeopardy!” contestants like any other player would. It juggles dozens of lines of reasoning at once and tries to arrive at a smart answer. After getting off to a scary-good start, Watson did have a few stumbles. In one instance, it repeated an answer that another contestant, Ken Jennings, who won 74 “Jeopardy!” episodes in a row, had already tried. “What is 1920s?” Watson said, sounding like a digitized Matthew Broderick. Inteligencia artificial. Coming soon in California: Un cambio tan dramatico como Internet.